Are you in control of your life? Do people take advantage of you? Do you have trouble saying no? Christian often focus so much on being loving and given that they forget their own limitations. Have you ever found yourself wondering: Can I set limits and still be a loving person? What are my legitimate boundaries? How do I answer someone who wants my time, love, energy, or money? Why do I feel guilty when I consider setting boundaries? Drs. 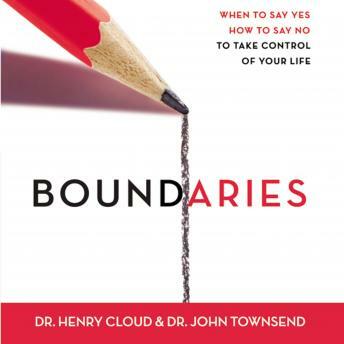 Henry Cloud and John Townsend give you biblically based answers to these and other tough questions, showing you how to set healthy boundaries with parents, spouses, children, friends, coworkers, and even with yourself. You'll see vital principles of boundaries at work as Drs. Cloud and Townsend take you through a day in the life of 'Sherrie'--first as she lives with almost no boundaries, then as she begins to apply proper boundaries with others in her life. Good book, but I find it very preachy! Overall though good quality book for Christians. I'm not a Christian, but I still learned a lot. Great book, but I did not care for the narration, especially when he read the parts that were quotes from women. Excellent Read !!! Don't miss this one. It will help you find the answers to your most troubling questions. This is a must-read book and the advice is incredibly helpful for anyone dealing with boundary issues. I had a very hard time listening to this narrator though. He was cheesy and over-dramatic when what he should have done is just plain read the book. He would do these terrible woman-voices that were distracting and then continue on in a "masterpiece theatre" voice from Sesame Street.